He talked about a wide range of issues, ranging from politics to family issues. Ukrainian President Petro Poroshenko has given his first news conference to journalists this year on the occasion of EU visa liberalization for Ukraine. The following is a selection of highlights from Poroshenko's speech on 14 May. "The Minsk agreements were incorporated into decisions of the UN Security Council, sanctions were imposed on Putin over the non-implementation of the Minsk agreements. We cannot reach peace, to which I aspire most of all, namely because Putin does not want to implement the Minsk agreements and is not going to. The Minsk agreements allow us to show the whole world who is to blame, the Minsk agreements give us a chance to go to court, draw criminals to account, including internationally. The Minsk agreements allow us to make sure that Russia pays the price, within the framework of international law, for violating them." "I would really like to see my idea about the deployment of peacekeepers get support. They were scared: when they saw that the idea about peacekeepers was getting popular, they arranged the explosion of an OSCE Special Monitoring Mission car, in which a US paramedic monitor got killed." "In exactly a week, I will spend many hours negotiating in Berlin with the German chancellor to prepared a meeting in the Normandy format." "I would like to dispel any suggestions that it could be more effective to have the USA involved in the Normandy format. I would like to stress that it has been and will be involved. Last names changed but there has been a diplomat at the ambassadorial level who was fully informed about the essence of Normandy negotiations. They were coordinated with our American partners." "In the near future, a special US representative will be selected to coordinate efforts with Ukraine." "There are almost two years of presidential mandate ahead and a lot needs to be done. As for the second term, the constitution says any person with certain restrictions is entitled to running for president. I think it is too early for us to be speaking about a composition of potential presidential candidates." "Never in the entire history of Ukraine there was such a level of freedom, in particular with regard to journalists and public activists. And if you watch TV, this will be the brightest evidence that you can play what you deem necessary, being guided exclusively by your own understanding of journalism ethics and standards." 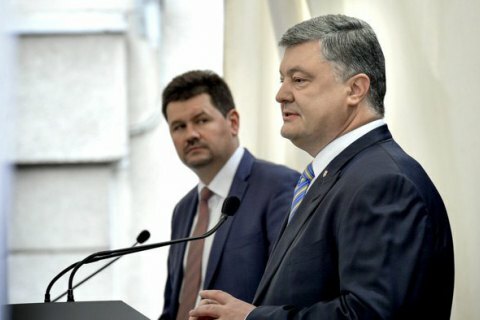 "I am aware that former employees of the former president's administration, who are now actively working with 'public activists', say about the so-called T's (the T-department of the Security Service of Ukraine, allegedly engaged in tapping political activists), who were brought to the former president and allegedly to me. I can say that starting from February 2015, when I learnt that some analytical centres use SBU analytical support, read their contents, I said that we do not need their publications and do not order these researches." "We have very democratic relations in our family. She is very active in public life. She did not consult me about her plans for a series of episodes, which have nothing to do with politics at all. But when I saw a trailer, I liked it. Let's criticize the show when you see it." About son Mykhaylo's "unacceptable" T-shirt emblazoned with "Russia"
"I talked to my 15-year-old son about this. Trust me, I found the right words to bring it home to him."